Transposition of the 1933 film. An expedition to a newly discovered island is undertaken by the Petrox Corporation to search for oil. Instead, they discover a gigantic gorilla, Kong. The expedition captures Kong and takes him back to New York, where he escapes from Shea Stadium and runs amok. This Petrox cargo plane drops off equipment at the island. Fred Wilson and Dwan arrive at Shea Stadium in a Petrox Bell 206A JetRanger. Registration N1351X, Serial 004. An NYPD Bell 206B JetRanger, N550JA, Serial 335, is seen warning pedestrians to stay off of the streets during Kong's rampage. 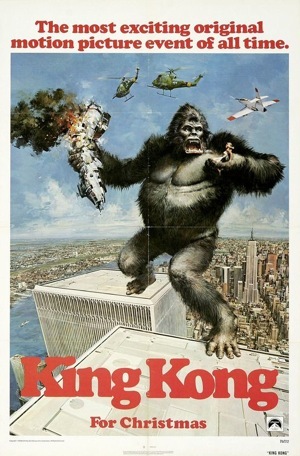 Instead of biplanes as in the original, Kong is attacked by a trio of US Army Iroquois gunships while atop the World Trade Center. This page was last modified on 3 January 2018, at 21:30.